— A small, empty cloth bag is expected this week to rocket past space capsules and a wristwatch worn on the moon to become the most valuable space artifact to ever sell at auction. 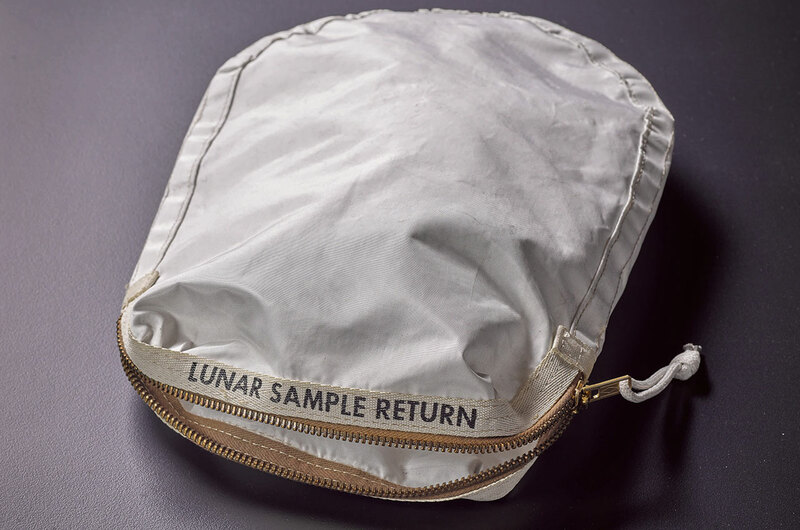 Sotheby's on Thursday (July 20) will offer the moon dust-stained "lunar sample return" bag as part of its first auction dedicated to the relics of the United States space program. The sale, which will take place at Sotheby's New York City gallery and on eBay, coincides with the 48th anniversary of the Apollo 11 moon landing, on which the bag was used. 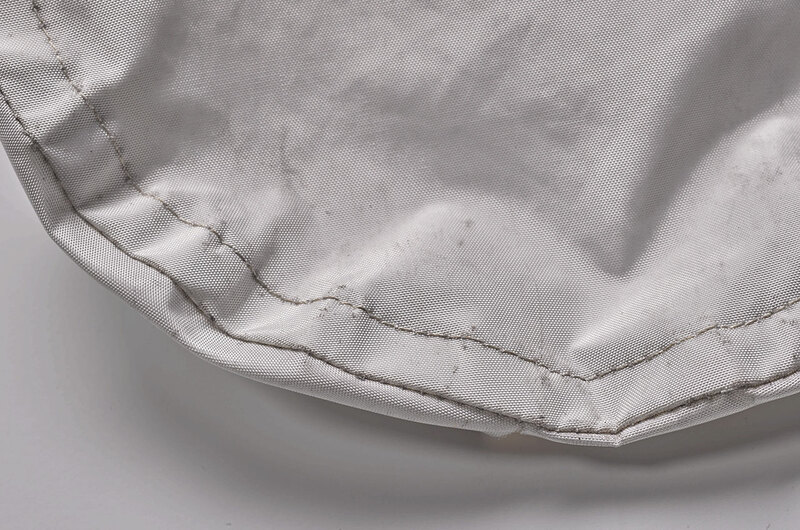 "This [Apollo 11 lunar sample return decontamination bag] is indeed the rarest and most important space exploration artifact to ever be offered," reads Sotheby's description for lot 102 in the July 20 "Space Exploration" auction catalog. "A true first of firsts; an item used to protect the first lunar sample, collected by the first man on the moon, during the first lunar landing." Sotheby's expects the 12 by 8.5 inch (30 by 22 centimeter) bag to sell for upwards of $4 million. 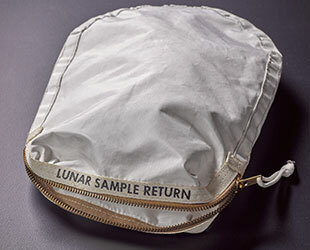 The zippered pouch, which was used to protect the bagged contingency sample that Neil Armstrong collected soon after stepping onto the moon, was mistakenly sold in 2015 by the U.S. Marshals Service and then briefly confiscated by NASA until a court ruled that it was to be returned to its present consignor. If the sale tops $2,882,500, it will be the most ever paid for a space history artifact, at least according to public auction records. "All other major space exploration artifacts that have sold have been Russian or from later U.S. missions," Sotheby's states in its catalog. 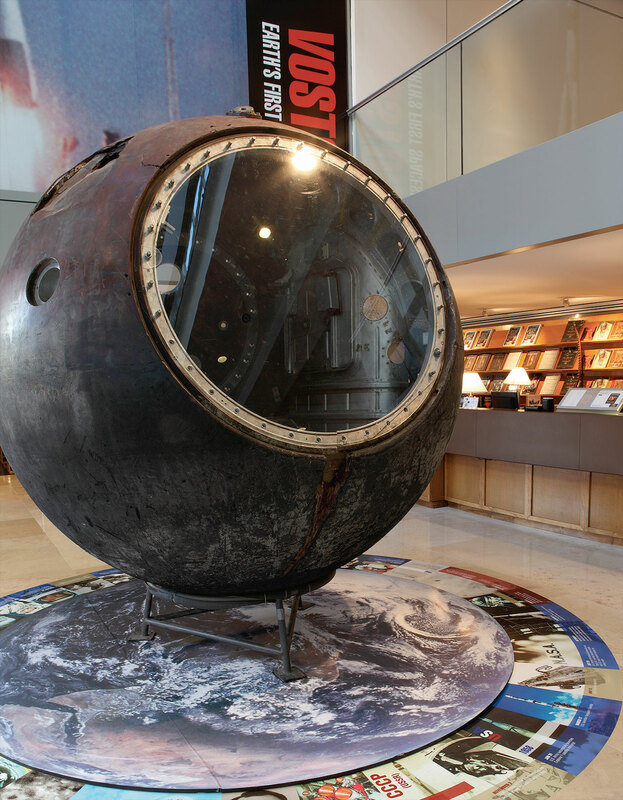 Sotheby's set the currently standing record for the highest price paid for a space artifact with its $2.9 million sale of a Soviet-era Vostok space capsule in 2011. The 7.3-foot (2.3 meter) spherical 3KA-2 spacecraft orbited the Earth on an uncrewed test flight just prior to the launch of Yuri Gagarin, the first human to fly into space. 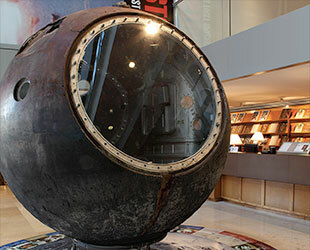 Prior to that, the top performing relic of the space race was another Russian capsule, also sold by Sotheby's. In 1993, the Perot Foundation, founded by Texas businessman and one-time Presidential candidate Ross Perot, placed the top bid on the Soyuz TM-10 spacecraft at $1,652,500 and then loaned it to the Smithsonian for display at the National Air and Space Museum, where it remains today. Third place, price-wise at least, goes to the only piece from a NASA mission to reach into the seven figures to date. A Bulova chronograph, flown by Apollo 15 commander David Scott and worn on the surface of the moon after his NASA-issued Omega Speedmaster broke, sold for $1.625 million during a 2015 sale organized by RR Auction of Boston. Last (but not least) among the million-dollar space sales is another Soviet capsule, a twice-launched Vozvraschaemyi Apparat crew and cargo vehicle. It was sold in 2014 by the Lempertz auction house in Berlin, Germany for 1.26 million euros (about $1.4 million U.S.). Other Apollo-era space artifacts have attracted bids in the mid- to high-hundreds of thousands, including a $610,064 hand controller used by Scott on Apollo 15, which was sold by RR in 2014, and a $358,000 set of moon dust-stained patches cut from astronaut Jim Irwin's spacesuit that was auctioned by Christie's in 1999. 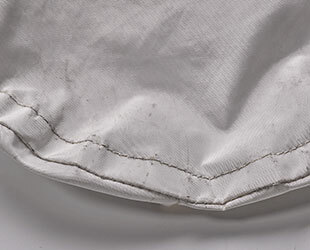 While the Apollo 11 lunar sample bag is the only item that Sotheby's estimates will sell for seven figures and have a chance at breaking the record, the 173 lot auction includes other standout space artifacts. An early prototype moon rock return bag designed to hold both the first contingency lunar sample and a "geology film cassette" was not used, but which represents "some of the first planning" to secure lunar samples, is expected to sell for $25,000 to $35,000. 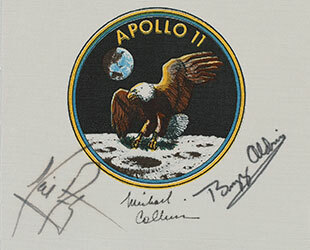 An Apollo 11 patch flown on the moon landing mission and signed by Neil Armstrong, Buzz Aldrin and Michael Collins may sell for upward of $60,000. The patch is silkscreened on the same glass-fiber (Beta cloth) material that was used as the outer layer of the astronauts' spacesuits. Sotheby's expects that a roughly 4-foot (1.2-meter) square silver gelatin print of the moon crater Aristarchus taken by the Lunar Orbiter V probe will elicit the second highest bid in the sale. The print, which is one of two known copies, is estimated to sell for $100,000 to $125,000. 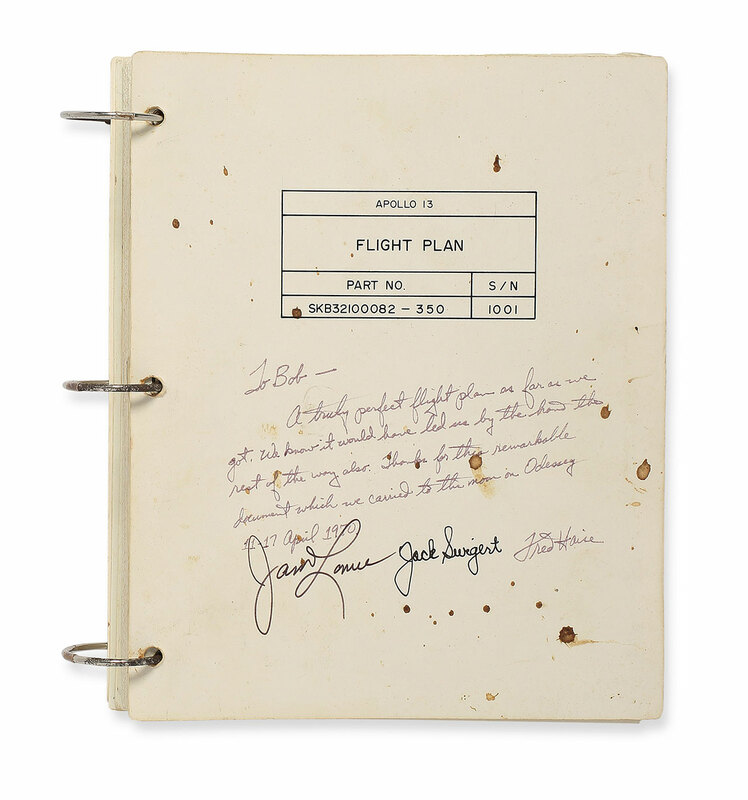 The auction also features the original flown flight plan from the Apollo 13 mission, which famously did not proceed as planned. 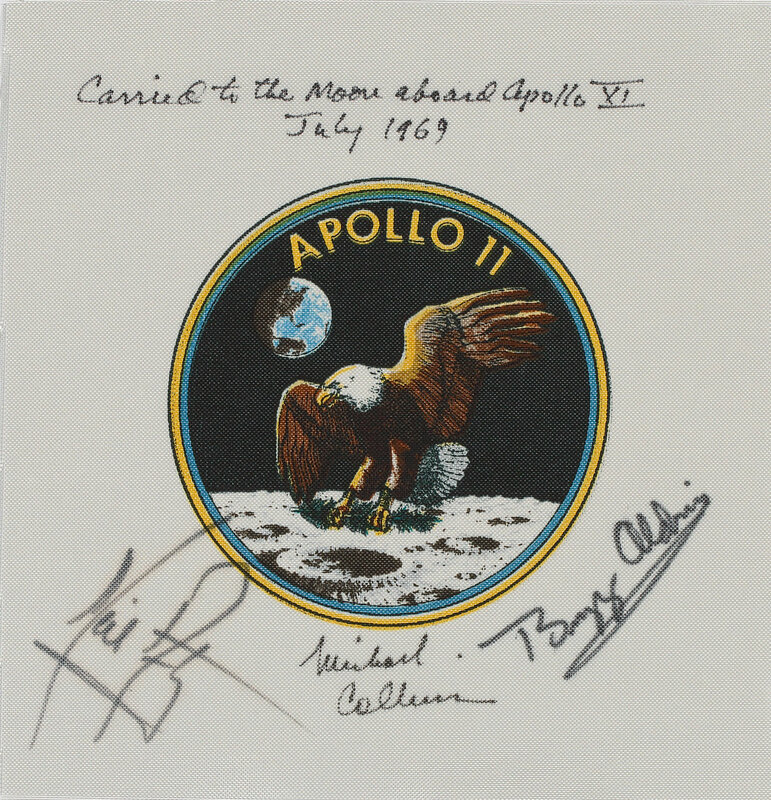 The 352-page document includes three full-color caricatures of crewmates Jim Lovell, Fred Haise and Jack Swigert, as well notations made by all three. The flight plan is expected to sell for as much as $40,000. On the opposite end of the spectrum, the least expensive lots (as estimated) are each expected to receive bids of at least $1,000. 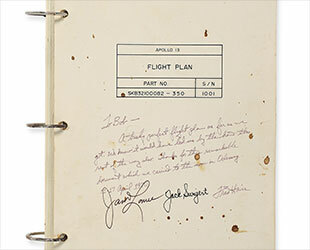 These artifacts include a smaller size print of Aristarchus; an Apollo 11 training checklist sheet signed by Aldrin; an Apollo 12 crew-signed envelope postmarked for their launch; and a black and white photograph signed by Alan Shepard and John Glenn, the first U.S. astronauts to fly into space and Earth orbit, respectively. For more details or to bid, see Sotheby's website or eBay.